Time for what you say? Time to write something again that isn’t related to the Alaska Trip. I know, I know, we got home on the 15th, and I think it now is the 27th of the month. The first week home, of course, was spent cleaning up and settling in. The second week home I had to go back to work and put in a good 40 hours or more trying to get everything to work properly again after a government software upgrade. Can you say “nightmare”? Finally, today, I managed to finish writing about the last few days of the trip. Somehow I just couldn’t make myself write about it, and each morning my ‘todo’ list had on it, “FINISH BLOG”. I am also not sure when I will be ready to change my header photo from that picture of Joe Lake on the Denali Highway. I am just not quite ready to let go yet. At least I am finally caught up. At least I will be until tomorrow! The MoHo is lined up in front of the Tracker in the driveway tonight as we prepare for launching once more tomorrow morning. This launch is a short one, though, just a 2 night trip to Silver Falls State Park a few hours north of here. We will hike waterfalls, check out all the amazing dahlias in full bloom at the Swan Dahlia Farm festival, and sit by the campfire in the forest, this time under starry skies. We will cap off the trip on the way home with a much anticipated visit with Donna K and Russ from TRAVELS IN THERAPY. I’m tickled about getting a chance to meet our fellow Oregonian blog friends. As I write, Irene is bearing down on the east coast, and Al has posted photos of the sad damage in the Ontario town of Goderich. So far, everyone I know who is east is doing OK. My daughter the trucker was in Connecticut, but traveled south and is now in Orlando. She managed to get out of the way of the storm. So far, all the RV’rs back in that part of the country seem to be hunkering down and doing OK, at least the ones who can blog about it. Out west all is calm, a few forest fires ignited last week in a thunderstorm are burning in Central Oregon, but everything around here is peaceful. Nights are in the 50’s, days are in the mid 80’s, humidity is low and skies are brilliantly blue. Oregon in the summer, when summer finally comes, is perfect. Within a few days of getting settled back in, we had the kayaks out for a paddle. It was a gorgeous morning, just cool enough to need a long sleeved shirt out on the water for about half an hour before we started peeling off our shirts. The lake was so calm and there was a bit of smoke hanging over the mountains to the east, but I didn’t care. Snow was still on McLoughlin, and just a bit on the rim at Crater Lake and Mountain Lakes Wilderness. It felt good to be out in the boats in familiar water. The funny part about familiar water is that on Klamath Lake it is never the same twice. The lake levels vary and sometimes the refuge can get pretty low, but on the morning we went out, the water was deep enough that we had no trouble paddling across what is called “The Wocus Cut”, a route that nearly did us in for a late fall paddle last year. At that time we were paddling in late evening and our paddles were scraping bottom. That was a rough ride that I don’t want to repeat! We traveled the beautiful canoe trail through the refuge and so enjoyed all the birds. I packed the camera along in the waterproof pelican case and took bird photos. Since I just bought a serious wide angle lens, battered though it may be, I won’t be getting a fancy bird lens any time soon, so I have to settle for the best I can do for now. I’ll let Judy take the fancy bird photos while mine will at least remind me of what was out there and how lovely they are. The greenhouse has created a jungle of tomato plants and at last a few are getting ripe. You have no idea what an amazing feat that is at Rocky Point! I planted some more spinach and lettuce for the fall, and am enjoying having a little bit of veggie garden to putter in.The daylilies are blooming beautifully, and so far the deer have left us alone. I sprayed the Liquid Fence almost immediately, and I don’t know if it makes the difference or if there just aren’t any deer around this year. The birds are back after a few days of filling the feeders, of course there aren’t nearly as many as there were in the spring before we left. It seems the finches and wrens are the most prolific right now, and I have seen several flickers and this morning a tanager graced my office window. For some reason the flicker was harassing the tanager as they both fluttered around in the sprinklers. Strange. I am not a daily blogger, unless we are traveling of course. I often wonder about whether I need to even write anything at all when we aren’t moving. Then I realize that I want to share the birds, and the lake, and the daylilies, and what better place to do it than here? While on our Alaska trip we gained quite a few new followers, and I thank each of you for checking in and paying attention. The rest of the photos for our kayak outing are linked here. I took not one single photo today. Not one. The 278 mile trip from our COE campground at LePage on the John Day River to our home in Rocky Point is a well traveled, well known route for us. Familiar. I suppose if I were in a different mood I could find something wonderful to photograph, there is beauty everywhere if you take the time to look and to see it. But on this day, Mo and I were what my daughter calls “barn sour”, we were heading home, fast, and not taking any time for anything except filling the MoHo in Madras. The sky was a bit cloudy in the morning and the heat of yesterday had cooled. The temperature was a balmy 60 degrees with a stiff breeze, and we were still in shorts. We did take a bit of time at our favorite little funky café at the Crater Lake Junction of 138 and 97 for lunch. We started this trip with breakfast there and decided it would be fitting to try lunch on this final day of travel. The place is not only famous for breakfast, but has sandwiches, burgers, and real chocolate milk shakes that are renown. It’s not Western Oregon Cool Food, it’s Eastern Oregon Comfort Food. Great lunch! Instead of driving the shortest route home across the beautiful Wood River Valley, we continued south toward Klamath Falls, with plans to stock up on home groceries at Fred Meyer, fill up the MoHo with gas, and dump at the free/donations accepted RV dump in Moore Park. It added a few miles to our trip, but we wanted to get home fully stocked and ready for the next go round. I was feeling a bit low as we traveled, remembering all the magnificent beauty we had seen over the past weeks, and the dry dusty eastern side of Oregon between Biggs and Bend wasn’t doing much to cheer me up. However, once we began slipping into the Klamath Basin, and Klamath Lake opened out in front of me, the magic returned. I do love this place. The skies blessed me with clarity as well, no fires adding muddiness to the horizon, and the big white puffies accentuated the gorgeous blue. There were white pelicans cruising above the lake, and the east slope of the Cascades were reflected in the water. There is still snow on Mt McLoughlin, a very unusual sight for mid August. It has been a cool summer in the Cascades for sure. As we got close to town I got all teary, and told Mo, “I have to see Melody”. She patiently negotiated the town traffic and parking lots with the MoHo and Tracker so I could run into Melody’s workplace for a serious daughter hug. It was great for me to see her, and I think that the hardest part of the trip was the inaccessibly by telephone while we were in Canada and in many parts of Alaska. Like so many busy families, we often keep in touch by telephone when we can’t get together, and I really missed that. Once filled and loaded with groceries and dumped, we traveled around Klamath Lake to our home. It’s always just a little bit scary coming in after being gone for so long, especially since our home caretakers had to leave a bit before we arrived. The long driveway opened up to the cabin, the greenhouse, the gardens, the big house, all sitting there in the brilliant afternoon light, welcoming us back. The deer still haven’t eaten the roses or the azaleas, even though I last sprayed Liquid Fence more than six weeks ago. The lawns were still green, the greenhouse intact with tomato plants to the ceiling. The cool summer has blessed me with a ton of green tomatoes, still, but hopefully they will ripen eventually. We spent the first afternoon just walking around a lot, unloading the necessities, and enjoying that great feeling of coming home. It has taken us three days to finish the cleaning up process, but that is less time than I imagined when I looked at all the dirt on all the rigs. Everything has been washed, cleaned, rubbed, and scrubbed. The laundry is finished, the ironing is done, the only big job left for me is the final writing of the story. I somehow stopped when we got to Hinton and never got back to the blog. Soon. We traveled 7,243 total miles in 41 days, 1,265 miles in the US getting to and from Canada, 3,991 miles in Canada, and only 1,987 miles actually in Alaska. The total cost of the trip was $6,168, with $4,659 spent on fuel, with an average of 5.14 per gallon since so much of our mileage was in high priced Canada. We stayed in campgrounds, either dry camping or with hookups 30 nights, with an average cost per night of $23. 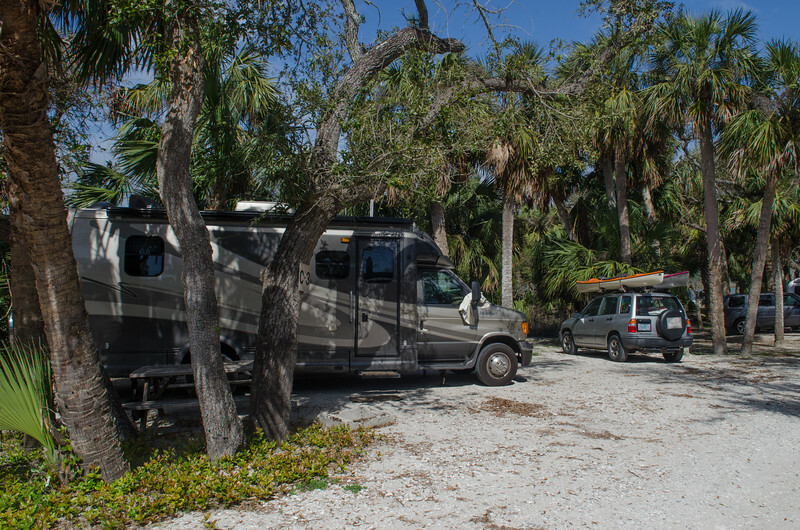 Our 11 nights boondocking brought that average down to $17 per night. We spent very little on excursions, with the Discovery River Trip and the Columbia Glacier Trip costing just $360. We didn’t eat out very often, and actually managed to cook from our grocery stash for a very large part of the trip. Total cost per day including food, fuel, camping and all incidentals came to $150.44. 75 bucks per day per person is a darn good price for a fabulous, incredible, life time vacation like this one. I took almost 6,000 photos and managed to delete some with about 3,200 left in my Picasa albums. Maybe I’ll delete some more, who knows, but not for some time yet. I’m having fun picking my ten favorites of each subject, just for fun. Waking up to gorgeous sunny skies and toasty temperatures, the four of us decided that Sunday brunch beside the Kootenay River would be a great way to share some good times before we continued on our way home. The casino in Bonners Ferry is beautifully situated along the river and the “everything” veggie omelette was wonderful. We finally left our good company at ten, and pointed the MoHo south on 95, through Sandpoint, toward Coeur d’Alene. I lived in the Coeur d’ Alene area for more than 30 years and coming back always feels like coming home. I have so many memories of those landscapes. Some of those memories are of my children growing up, some are of happy times at the lakes and rollercoasters with my grandsons, others are of the years I spent driving all the back roads and working the mountains. I never fail to feel a bit nostalgic when I am in Northern Idaho, yet as much as I love it, I know I was a different “me” back then. I don’t think I could go back. Of course I have old friends there, but none quite so dear as my friend Laura. Although her kids were the same age as my grandkids, we have great memories of them sharing egg gathering, garden dirt, and summer lakeside playtimes when Coeur D’Alene was one of the loveliest places in the world. I looked forward to seeing Laura on this sunny summer Sunday. Among many other things, we especially enjoyed shared gardening, our horses, camping trips with our women’s group, and cooking together. With so many miles between us, we don’t get together often, but when we do it is just so wonderful. Heart friends, that’s what we are. Laura is married to Alvin, a homebuilder in Coeur d’Alene, and he had some sad stories about the homebuilding industry in the last four years, but good news is that he just finished a beautiful home for some doctor. According to Alvin, the doctor even had trouble getting financing, and the rules and regs associated with building the house were far more daunting than they had been in the past when dealing with the financing companies. Interesting stuff. The best part of the mid-day visit however, was the fun getting lost in Laura’s crazy gardens. Laura laughingly called herself a “garden hoarder”, and I think she is right. Lush, crazy, out of control gardening at its finest. Laura is a respiratory RN at Deaconess in Spokane, and I’m not quite sure how she manages her acre of garden insanity while working full time and taking care of her little granddaughter. We had a lovely lunch of garden goodies, topped of with some iced herbal tea while catching up on stories about old friends, family, kids, and grandkids. It was a great way to make a long drive a bit more fun. By the time we left Laura’s it was close to 2 in the afternoon, and we decided that we were going to just drive until we reached the Columbia River. It put us ahead of time an extra day, without the night in Spokane that we originally planned, and that sounded great to both of us. We drove through the dry, open, dusty farmlands of eastern Washington, negotiated the winding ramps and exits of the Tri-Cities on 395 and fought the winds on I-84 along the Columbia River. Our favorite little overnight spot at the LePage COE campground had number 11 open and waiting, even without a reservation. Half price at ten bucks for electric and water is a deal for sure. Again, it was hot and we really wanted power, but once we settled in the breezes started up in full force and we cooled down for a good night’s sleep before starting the last leg home. We started the trip with the first night out in LePage and spent out last night on the road here as well. I woke up this morning missing Alaska and the Highway, the open road with no cars, the memories of the road to Valdez, the road to Haines, the utter silence of Joe Lake on the Denali Highway only a memory in my mind. We are parked in the Wal-Mart in Cranbrook, British Columbia, just 50 miles north of the border and this morning will be traveling to visit our friends in Bonners Ferry and spending the night there. I have the past three days still to talk about and remember, thank goodness I have the photos to remind me. I still have the camera to take the photos which is amazing, but that also is part of the story still to write. These last few days have all run together, filled with the magnificence of the Rockies, Alberta and the beautiful Canadian National Parks. There are still gorgeous photos of beautiful mountains and lakes to come, the rest of the story is still to be written. The stats of the trip to soon be calculated, more than 7,000 miles so far and more to come. Parking at the Wal-Mart here has been delightful. It was a long day yesterday trying to find a place to be on a hot August Saturday night in an area that is focused on golf and resorts. Wal-Mart is filled with RV’s, but still not as crowded as the slide to slide packing we saw in the few RV parks we passed yesterday afternoon. We have free Wi-Fi right here in the rig from the McDonalds down the street. Enough for now, just know that there is more to come. We still have several hundred miles to go before this trip is finished. I had no clue that the trip would be as amazing as it turned out to be. I had no clue Alaska and the Yukon would capture me the way it did. I had no clue. Enough for now. There will be plenty of time to write about the past few days on the long road home. We woke to beautiful sunny skies in our filled WalMart parking lot. Out behind the rig a dad was tossing a baseball to his two kids and they were yelling at each other like it was mid-afternoon in a park rather than 7am in a parking lot. It was nice to have shopping a few steps away, and a cheap RV dump just down the street at the Husky station. We even had fast WiFi right in the parking lot from the McDonalds located WalMart. We sent and received emails from our friends in Bonners Ferry, confirming an afternoon arrival when Georgette would be back from Spokane. Since there was time to spare, we decided it would be great to backtrack ten miles for the 10:00 AM opening of the Fort Steele Heritage Town. The site contains restored buildings from the original town, as well as re-constructed buildings that would have been typical to the area during the period between 1890 and 1905, complete with costumed actors discussing the daily (1895) news as they walk the streets. It turned out to be a great experience and a truly lovely little town. I found myself often slipping back to a time when the streets were quiet except for the clip clop of horses pulling wagons. There was a working blacksmith, and a wonderful bakery where I bought heavy loaves of great sourdough bread for us and for our Bonners Ferry friends. The glacial lake terrace nestled at the base of the Kootenay Mountains above the Kootenay River is soft and lush. I can see how it would have been a perfect place for a settlement of any kind. The buildings have been restored and furnished with loving care and the setting is beautiful. We ambled along the streets for more than two hours, finishing our wanderings with a cone of home made fabulous ice cream for Mo and I had a root beer float. It was hot, and I do love root beer floats, especially when made with vintage root beer. Nina and Paul (the folks over at one of my favorite blogs “Wheelin’It” would appreciate the dog friendly atmosphere, with Abby welcomed into the site and bowls of doggie water conveniently placed around for the hot day. It was a great deal for only 5 bucks per person, with a two day pass including all the wagon rides and the vaudeville show available for only $20 per person. By noon it was about time to amble down the road a few miles to the US border and once again cross into our home country. We were ready with all our papers and passports, having become old hands at this border crossing thing after so many times coming and going on this trip. At the crossing, we stayed well back of the big white line and the stop sign while a few cars ahead of us seemed to be crossing without incident. When it was our turn, we could see at least a dozen cameras aimed at all the strategic points of our rig recording every possible angle. We also know about the scanners that can see the hidden lines in US paper money and let the guards know exactly how much money you are carrying if it is in bigger bills. The questions were simple, and our border crossing guard was an amiable guy. He didn’t even ask how long we had been away, what dates we left the USA, when we left Alaska, etc, all questions that we had memorized with careful checks of the calendar. He simply looked at us and asked Mo what the license number of the rig was. Now come on! How many of us know our license numbers by heart! Luckily I could answer quickly because I am the one that usually goes inside when we register for campgrounds and after this trip I had it down! He waved away my offering of the animal papers with a friendly smile, and said “Welcome home”. That was just so easy. In just 30 more miles we were driving up the narrow dirt road to Georgette and Chet’s beautiful spacious log home overlooking the Kootenay Valley at Bonners Ferry. We visited last year on our way out for our trip to the northeast, and now this year on our way back home from Alaska. Georgette trains Australian Cattle Dogs for herding and is now working on herding ducks, in addition to sheep and cows. Her dog is a great champion, and he thought Abby was just the cutest thing around. We found out that the racoon tail that looks like it was grafted on an Australian Cattle Dog is a sign of their pedigree, and the “lesser” blue heelers (which Abby has a bit of in her genes) have docked tails. Georgette is a great cook and an even greater talker and we always have a wonderful time when we get together over wine and good food. They have a nice level site for the MoHo with water and electric, and enough power that the AC ran just fine to keep Jeremy nice and cool during the exceptionally warm evening. It’s always nice to spend time with good friends and we laughed long into the dark night before going back to the MoHo to greet a very lonely and vocal cat. By the time morning came and I had a good night’s sleep, I was in a much better mood, and knowing that I still had a camera that worked helped my mood as well. We didn’t have much of a plan for the day except to continue south along the Columbia Icefield Parkway, to see at least part of Banff, maybe visit Lake Louise, and then find a place to camp for the night. We left the campground quite early, hoping to have plenty of time to amble along and see whatever caught our fancy. In fact, it was so early that I had trouble taking photos with much of the landscape still shadowed by the incredibly high and steep Rocky Mountains all around me. As we climbed to the summit of the parkway, I was excited about seeing another glacier and the famous Columbia Icefield. Jasper is certainly beautiful, and the Rockies have their own personality, all that limestone makes shapes that are very different from the volcanic and wild metamorphic mountains that we have traveled through in Alaska. We arrived at the glacier early enough to miss the most of the tourists. I had somehow expected lots of ice along the Icefields Parkway, I have no idea why, but I pictured it all snowy and icy and that we would be driving very close to the icefields and the glaciers. It isn’t that way at all. The glacier itself is just a small piece of its former glory, like so many others, it has receded dramatically in the last half century. We walked around a bit, but weren’t inspired to do much hiking through all the rubble to the tiny bit of dirty blue ice that was visible to us from the trailhead. Again, there were the markers showing the extent of the ice in years past, and the incredibly fast rate of recent recession. The visitor center at the summit of the parkway is reputed to be beautiful and interesting, but the parking lot was already getting full and we just weren’t up to another battle to see more stories about the Columbia Icefield. Do I sound jaded? I don’t mean to. It was truly a beautiful drive, but we were so very spoiled by the beauty and especially the isolation in Alaska that it was hard to get into visiting here. I hope we go back sometime, and take the time to enjoy the special beauty of the Canadian Rockies and the beautiful national parks, and especially some of the surrounding areas. Sometime when I am not filled with images of solitude and isolation and roads that stretch for miles without another vehicle in sight. As we continued south, the traffic started picking up and it was hard to pull over into any of the turnouts for pictures because they were already full of cars and people. There were some incredible lakes along the way, with reflections that were breathtaking, and the photos I got show a bit of blur to the trees because I had to get them while we were moving, out the window. Still, when I look back at these photos, I am amazed at the color and shapes. The road south to Banff is excellent, with interesting bridges constructed across the highway to allow the animals to cross safely. Literature suggests that these barriers and bridges are actually working, although I couldn’t help wondering what would happen to an animal who happened to find its way inside the big fences along the highway. How would they get back out? We decided early on that driving east into the actual town of Banff wasn’t something we wanted to do. Camping there is tight and expensive, we had no reservations, and after all this was a Friday night. Instead I just wanted to see Lake Louise, maybe hike around a bit, maybe even go for a kayak. Silly me. Once we arrived in the town of Lake Louise, the crush of traffic and tourism really became fully apparent. I once heard that Moraine Lake was even more beautiful and a bit more isolated, so we decided to go there first. Parking the big rig in the visitor center parking lot was easy enough and we unhooked and loaded up into the baby car with the dog. It was under 20 miles of narrow winding road to the parking lot for the lake and another 1/2 mile to walk from the long line of cars already parked along the road outside the lot. Hmmm. In spite of the crowds, though, the short hike around the lake was well worth the effort. Moraine Lake is a lovely turquoise gem set into the rugged mountains. The lodge was lovely, small and inviting, with wonderful cabins overlooking the lake with huge picture windows and fireplaces. It might be fun to be there in the morning and evening after all the people thinned out. Abby loved swimming as well, even though the water was cold from the glacier that feeds the lake. After our hike, we returned to the car with the plan to take a similar hike at Lake Louise. We drove past the lodge and tried to figure out just how many miles we would have to walk before we got past the parking lot. The traffic was thick, and jammed to a halt trying to get into the filled lot that was farthest from the lake. Maybe I will see Lake Louise on another trip, but this time we looked at each other, hooked a fast u, and drove back to the motor home and out of the town in short order. In very little time, on that broad smooth fancy highway, we were traveling west on Highway 93 toward Kootenay National Park, another Canadian gem. There were far fewer people on the road, and the vistas were lovely, but it was still too early in the day to think about stopping so we just continued on west toward British Columbia and Radium Hot Springs. I have always wanted to visit Radium, and many of my friends from the Spokane area loved to go to Fairmont Hot Springs for skiing and winter sports. Radium Hot Springs was a charming little town, but the crowds were again building and the traffic was getting heavy. We stopped for a photo of the odor free pools, filled up with gas and continued south on 93, admiring the beautiful Columbia River Valley from high on the hill and laughing at the bighorn sheep wandering around through town. Mo was getting a bit tired with all the driving, and we were both in the mood for a steak of some kind, so we thought that a stop in the Invermere Visitor Center would yield some good information. Usually the visitor centers are wonderful places with great volunteers eager to share their joys with us. That was not the case here. The two women were incredibly snotty, acting as though we were unbelievably stupid to think there might be a place to stay on a Friday night, and that we were even more stupid to think we would find a steak in Invermere. Well, excuuuuussseee me!! I guess this strip through BC is fairly toney, with most of the RV parks converted to lease lots and resorts not particularly suited to travelers just passing through. We found a tiny place on the map called Fort Steele, and I asked one of our non-friendly ladies if there might be something there, and she seemed to think we could park in the Pioneer Town parking lot. Fine. Another 80 miles or so was nothing, right? Yaay! Off we went down the road, ten more miles, to the sweetest WalMart I have seen in a long time. We certainly weren’t the only ones with the same idea as the parking lot was filled almost bumper to bumper with motorhomes and fifth wheels, some folks even set up with chairs. I told Mo the boondock etiquette suggests we don’t open our slide, but we decided to do it anyway. Our rig is half the size of most even with the one slide extended! We did not set up the bbq or put out the chairs at least. There was an employee in the parking lot and I asked him where I could find a good steak and he sent us down the road to Mr Mikes where we had a great steak supper with a “cheap” bottle of red house wine that set us back $31.00. Guess we should have asked the price when the waitress told us about the 5 bucks off special on the house red. LOL That dinner cost 100 bucks but it was a deal at any price after our long day, and our night at WalMart was free and just about perfect. I slept like baby. We woke this morning to misty drifts of fog slipping in and out of the hills around us and by the time we dropped down to the town of Hinton for fuel, the fog was so thick it was hard to find the gas station. Even early in the morning, there was considerable traffic on Canada 16, where Hinton is the gateway town between Edmonton and Jasper National Park. We were in no hurry, though, and as we climbed into the massive Rockies, the fog lifted, exposing a higher level of cloud cover above us. When you enter the National Park, if you don’t plan to stop, they will wave you through without a fee. We told the agent that we wanted to kayak a bit and then find a place to camp somewhere between Jasper and Banff and she smiled and charged us a little over 16 bucks for a pass to both Jasper and Banff that was good until 4PM tomorrow. Perfect. With a park map in hand, we decided that Maligne Lake looked like a perfect spot for kayaking and turned east, crossing the Athabasca River to travel beyond Maligne Canyon to the lake. About half way there we found a great empty turnout and parked the MoHo, thinking we could save a bit on gas if we just drove the baby car. I am so glad we did that, because the parking situation at the lake was tight to say the least, and while there was plenty of room when we arrived at 10am or so, by the time we got off the lake it was an entirely different story! We launched the boats in cloudy skies, but after a bit of time on the lake the sun peeked through, warming us and making everything in view just sparkle. Maligne Lake is famous for the island at the far end of the lake, Spirit Island. It was a photo of this little island that made me want to put my boat on this lovely water. The only problem is that once again, we are in a very popular national park, and concession boat rides to Spirit Island are the only way most folks get to see it. The cruise boat traffic was busy, with a boat leaving about every ten minutes and another one returning. The lake was beautifully calm, so the big swells from the wakes from these boats were dramatic, and we just rode along with them. The lake is more than 7 miles long and we really didn’t have the time for a 14 mile paddle, so we traveled along the west side of the lake about half way before crossing over to the eastern shore for a break. The water was perfectly clear, and Abby loved her swim while we walked a bit along the shore. It was a beautiful day, a beautiful moment, a beautiful time on a beautiful lake. Ahhhh. When we arrived back at the launch dock, we were surprised to find it crammed with people. They were all hanging around in the middle of the boat launch taking photos, standing around everywhere, and there were so many cars in the parking lot that we knew there was no way we would manage to get the car down to the launch. Instead, we picked up our 34 pound wonder boats and carried them up to the lot for loading. The rental RV’s were bumper to bumper trying to find parking, and one lucky person in a sedan had managed to park in the ditch and was stuck. We just loaded up the boats and got out of there as quickly as possible. By this time the sun was out in full force and it was actually hot. We were happy to see the motorhome peacefully waiting in the one turnout that wasn’t occupied, hooked up the baby car and made some lunch before heading back out the Maligne Lake Road to the highway. On the way we saw several wildlife traffic jams, but one of them was actually worth stopping for, and I joined the crowds taking photos of a very unconcerned bull elk. Mo said she had never seen a rack as big as this guy, and I don’t think I have ever been that close to a bull elk ever. Probably not very smart. Back in my soil survey days, we had stories about encounters with bull elk, but usually that was in the fall during the rut. This guy was pretty darn tame, I guess. We ambled on through the park, enjoying the views and the animals and decided that stopping in Jasper for cute little shops wasn’t worth the effort to park. Instead we drove slowly with all the other tourists, and I took photos out of the window cafes, and stores, and tourists. Jasper town was really quite nice, with many old homes converted to B&B’s, and lovely gardens. I could enjoy staying in Jasper for a week or so and taking more time for hiking the many trails and kayaking the many lakes. The maps looked so enticing. Instead, we were getting into the home mode, and after six weeks traveling magnificent Alaska and the Yukon, this lovely little park full of tourists was a bit less exciting than it might be if it were our planned destination. We continued on south along the Athabasca River, planning to stop at any of the campgrounds along the Icefield Parkway that had room for us without a reservation. I was a bit skinned and bruised but that had nothing to do with the sick feeling in my stomach. Deanna’s lens. The super fast, super heavy, (later I found out it is $1539 bucks of super) lens took the full brunt of the fall. Not to mention my brand new camera. The lens filter was splintered and the metal edge of the lens was bent, the mechanism was stiff and acting funny. Duh. I clicked. Nothing. Clicked again. Nothing. I am so sick I can’t even cry. I put one of my other lenses on to see if it was just the lens. Click. Nothing. Then I look a little bit closer and see that the on/off button has shifted in the fall. Turn the camera on. Click. IMAGE! I put Deanna’s lens back on. Click. IMAGE!! I think it must have been the heft and solidity of that fancy NIKON lens that took the hit and saved the camera. I tried several shots with Deanna’s lens, and except for a bit of stiffness in the zoom, it seems to still have perfect auto-focus and the images look fine. Incredible. Of course, I have to replace her lens, and insurance is $1000 deductible, so it’s coming out of my pocket. The good part about all this is that I never would spend 1500 bucks to get that lens for myself, and now I have one. Maybe a bit bent, and maybe not perfect, but still working and now mine. By the time we backtracked and settled in to Mt Kerkeslin campground, $12 for a dry site, I wanted nothing more to do than sit and drink a beer on the sofa. My body hurt, my mind hurt, and I was a wreck, even with the reasonably good outcome. I felt like any step I took was going to put me on the ground somehow, it was definitely disconcerting! Mo took Abby for a walk, and we canned any plans to hike Athabasca Falls. I sat there alone on the sofa saying a ton of “thank yous” to the powers that be for letting the worst moment of our trip not be any worse than it was.